While it is not surprising that one of the greatest composers of all time would say something with such vigor and magnitude as the quote above, it makes the words no less powerful. One definition of revelation is “the divine or supernatural disclosure to humans of something relating to human existence or the world.” Including music as one of these divine disclosures should be enough, but just take a moment to think about what Beethoven is saying here. Think about how far the human race has come, even in the 18th and 19th centuries when Beethoven was around. The idea that music should be regarded as “a higher revelation” than any and all other progress made by the human race is an absolutely mammoth claim. And I, for one, agree with him. 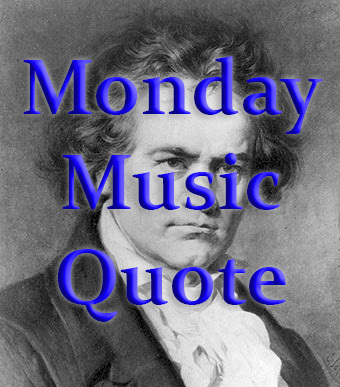 This entry was posted in Monday Music Quotes and tagged Beethoven, Ludwig van Beethoven, Monday, Monday Music Quote, Music, Music Quote, Quote.